There are all kinds of foods that can be served hot from the crockpot, including meatballs, hot dips, chicken wings, and hot dog snacks. It's a great choice for tailgating, potluck dinners, and home or office parties. When transporting food in a slow cooker, start with hot food. Keep the slow cooker in a larger container well-wrapped in towels so the food will stay hot. Plug it in when you get to the party. Frozen meatballs make these sweet, sticky meatballs a snap to fix. Garnish the meatballs with some chopped green onion or cilantro. Serve them from the slow cooker with small plates, toothpicks, and napkins. This cheese dip is flavored with salsa, green chile, and some onion. Add extra heat with some jalapeno peppers if you'd like. Ground chicken thighs make these chicken meatballs moist and juicy, but feel free to use part chicken breasts in the meatballs. The meatballs are well seasoned and served with purchased barbecue sauce. These meatballs are baked and then they're cooked in the slow cooker with a tasty homemade barbecue sauce. Use your own homemade meatballs or a good quality frozen meatball. These popular meatballs are made with a tasty grape jelly sauce. These pecans are cooked in the slow cooker with a combination of melted butter and several spices and herbs. This easy dip is always a hit. It's made with cheese, salsa, and optional cilantro. Add some onions, bacon, or ground beef if you'd like. These homemade meatballs are glazed with a hoisin sauce mixture. Garlic, rice vinegar, ginger, and sesame oil are among the ingredients. A combination of soy sauce, sambal, ginger, garlic, brown sugar, and soy sauce flavors these delicious teriyaki chicken wings. This cheese and ground beef dip mixture is flavored with a can of no-bean chili. Serve these kielbasa bites warm from the slow cooker. Use a spicy mustard in the recipe or use your favorite Dijon or brown mustard. 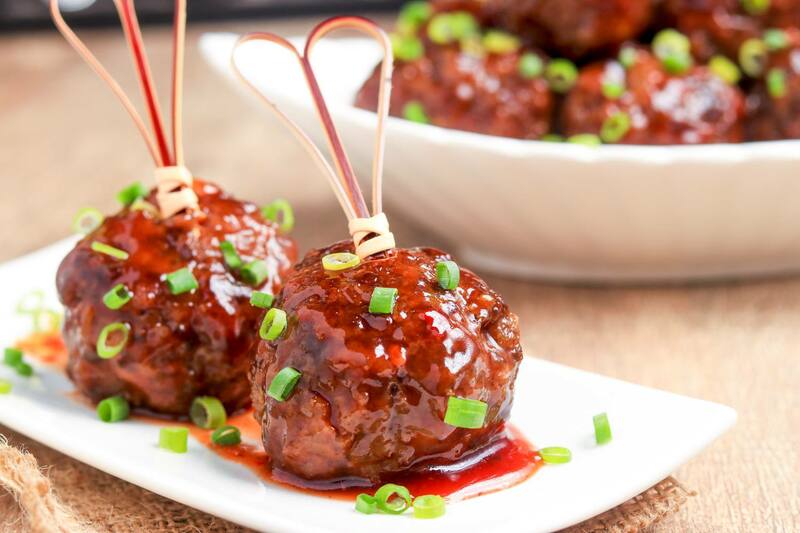 Apricot preserves and barbecue sauce are combined to make the sauce for these appetizer meatballs. The meatballs are made with half ground beef and half pork sausage. These meatballs are always a hit. Add some pineapple chunks to the sauce if you'd like. These party meatballs are flavored with a sweet and tangy homemade barbecue sauce. We add a small amount of ground cayenne pepper to the sauce but feel free to leave it out if you prefer a milder flavor. Crock pot mini smoked sausages with grape jelly. Miniature hot dogs or smoked sausages are delicious in this surprisingly tasty grape jelly sauce. This fondue is especially fun with a small group of friends. It's a classic Swiss cheese fondue with a bit of Kirsch, garlic, and white wine. Serve with chunks of crusty bread. Grape jelly is the secret ingredient in these delicious meatballs. Chili sauce and Dijon mustard are added to the jelly to make the tangy sauce. Cheese, browned ground beef, and seasonings make this a thick and hearty dip. Serve the dip with sturdy tortilla chips or crackers. These meatballs are cooked in a tangy homemade barbecue sauce. Ranch dressing mix, butter, and hot sauce flavor these simple crockpot chicken wings. The wings may be cooked in the slow cooker or in the oven. These tasty pork meatballs are flavored with a sauce of honey, ketchup, garlic, and soy sauce. Taco seasonings, Ro-tel tomatoes, and Velveeta cheese get together in this tasty dip. This is an excellent snack to serve hot from a slow cooker. Use cocktail wieners or mini smoked sausages in this recipe. This easy dip can be cooked in the slow cooker or oven. The dip is made with classic pepperoni pizza ingredients, but feel free to use your family's favorite toppings and cheese. Barbecued meatballs are always a hit, and they're even better in a homemade barbecue sauce that includes beer. Bourbon adds flavor and spirit to these tasty cocktail franks. This dip is always a party favorite, and it's super easy to make. Classic corned beef Reuben sandwich. The flavors of the famous Reuben flavor are combined in this tasty cheese dip. With all of the cheesy goodness, a little hot pepper kick and a hint of smokiness, no one will believe that you just assembled the ingredients and let your slow cooker do the rest. Use lobster, crab, and shrimp or use a combination of shrimp and crab in this tasty cheese dip. Crock of warm broccoli and cheddar dip. This broccoli cheese dip is sure to be a hit at your game day party or any other gathering. These chicken wings are cooked to perfection in the crock pot with honey and barbecue sauce. Use homemade or purchased meatballs for this tasty appetizer meatballs. This refried bean dip is a snap to make and cook in the slow cooker. This nut snack is easy to fix in the slow cooker. These meatballs are cooked in sweet and sour brown sugar sauce with pineapple and green bell pepper. This slow cooker party mix is a combination of peanuts, cereal, and pretzels with a variety of spices and seasonings. This is a very easy spinach dip to prepare and cook in the slow cooker. Cream cheese and Parmesan dip add flavor to this yummy dip. These delicious sliders start in the slow cooker. The beef is cooked, shredded, and then baked in Hawaiian rolls with cheese, taco sauce, and jalapeno peppers. This is an easy snack to fix for a game day party or gathering. Beer and mustard give the sausage excellent flavor. This shrimp with garlic is super easy. The sauce mixture is slow-cooked and then the shrimp is added about 1/2 hour before you plan to serve.